The original recipe calls for thawing the edamame first, but we have found that it cooks just as well frozen. Add the frozen edamame to a pot of boiling water, return the water to a boil and cook the edamame until the beans barely begin to soften — about 2-3 minutes. The edamame will begin to float up to the surface of the water when they’re almost done. Drain the edamame and sprinkle with a little Kosher salt. Allow the edamame to cool before you add the remaining salad ingredients. Slice the radishes and green onions (both white and green parts) and chop the parsley. If you’re using spinach and/or arugula, chop those up as well. 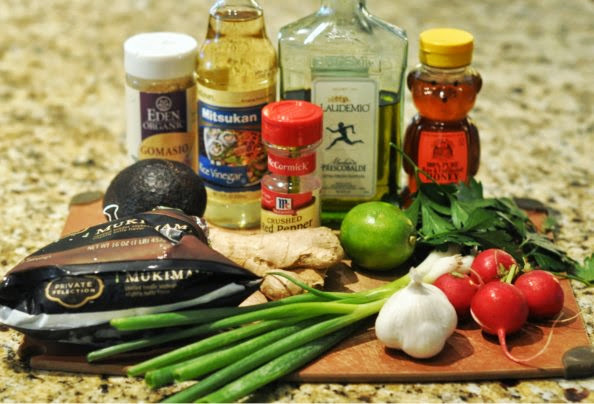 Whisk together the dressing ingredients: rice wine vinegar, olive and sesame oils, chili garlic sauce, minced garlic, finely chopped ginger, honey, lime juice, red pepper flakes and salt and pepper. Just prior to serving the salad, cut the avocado into small pieces, add it to the other ingredients and toss, slowly adding dressing until the salad is dressed to your liking. Garnish with toasted sesame seeds for additional sesame flavor and a bit more crunch. Serve the salad alongside an Asian-style protein (this fish is a good one), or all by its lonesome. This fresh and delicious salad has enough protein, nutritional value and varied textures to constitute a meal in its own right. Bring a pot of water to a boil, add the frozen edamame and return the water to a boil. Cook until the edamame begin to float to the surface and barely begin to soften — about 2-3 minutes. Drain the edamame, sprinkle with Kosher salt and allow to cool. Whisk together the dressing ingredients until well-combined. Combine the salad ingredients, slicing and adding the avocado just prior to serving. Slowly add dressing and toss until the salad is dressed to your liking. Garnish with toasted sesame seeds.